Hello Friends! So I thought it had been a bit since we have talked food! Out weather here in Wisconsin has been all over the board! We were at 50 earlier this week and today I think we have a high of 24! I know we are so ready for spring heck I’m ok with jumping straight to Summer! I thought I would share some recent recipes we have made that have received thumbs up by the two biggest critics in our house and if you have kids I’m sure you agree. If the kids like what you cook it can make dinner more enjoyable! I will also mention we did do “Hello Fresh” for a few months and absolutely loved the variety and the quantity was perfect. It got me out of my funk of feeling like I was cooking the same things each week. Plus, it had all of us trying new things and again the kids really liked I would say 98% of the dinners we made. So if you haven’t tried it I would recommend it as I think they are still offering a first week free. Let’s talk soup as Joe loves soup and I like making them for a few reasons. Many times the recipe makes enough to freeze and have another meal next month. The Chicken Tortilla Soup was the first recent one I tried. Everyone enjoyed it we added Frito’s to it as well as cheese and Joe and I added jalapeños! It was filling and there was an entire second meal to freeze with the left overs! Stuffed Bell Pepper Soup was the next soup we made! I honestly had no intentions of making this soup but realized I had to bell peppers in my fridge that were about to be expired. I hate when I buy food and forget about it or why I bought as I’m sure I saw a recipe I wanted to try. But then life happens and there went that idea! This soup wasn’t an all day process it took me about an hour and a half from start to finish as it simmers for 30 minutes. Joe loved this soup as he said when we have stuffed peppers they can be a pain and sometimes there is more bell pepper than you want and not enough filling. With it in soup form you decide the balance. Flavors of this recipe were good we added cheese. The kids aren’t big bell pepper fans so they ate the filling only. Which I am fine with as they ate what I made and a side of bread with butter. We are a big dipping family so bread and butter is often on the table at dinner time! This one had leftovers too but I decided to enjoy this for lunch for a few days as to freezing. For those of you that aren’t in soup mode I recommend trying Potato Chip-Crusted Spicy Macaroni and Cheese. We love a little spice in our life so I knew this would be a hit. S is the only one that prefers things a little more bland so I didn’t put as much jalapeños in but still but a good amount. You can always add spice but can’t remove. This was a quick recipe and again all the ingredients were on hand. The portion of this was maybe more enough for a family of 6. Or of 4 with kids that have larger appetites. This too was lunch for me for a few days. I will also say I’m not a macaroni leftover kind of person. I just think something happens when they get cold that just doesn’t make them work the day after. 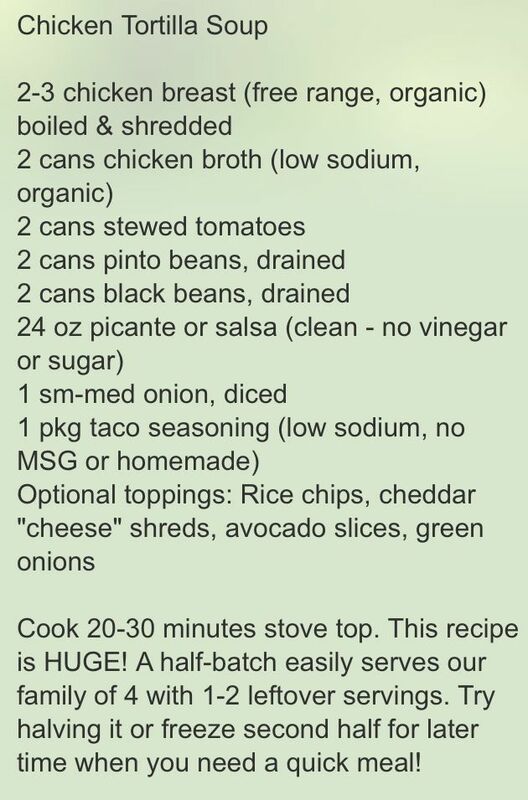 But I think there is enough going on with this recipe that I was happy to eat it as leftovers. Last is the recipe that I LOVED but I am a goat cheese fan. The creamy deliciousness of this cheese is just so good to me. Joe is not a huge fan of goat cheese he’s definitely the less adventuress, more traditional one when it comes to food. But I will say he did have two servings so you decide how much he really didn’t like it…I think he secretly loved it. Ok so the recipe is One Pot Chicken Rosemary Goat Cheese Pasta. Oh ya I am not a huge rosemary person so I eyed my portion as in everything but know I did a bit less than recommended. Yes, all the magic happens in one pot who doesn’t love this? After a good meal who wants to be doing a ton of dishes?! Not this girl!